With two different world-renowned golf courses at Incline Village, there is no way to beat this Lake Tahoe golfing. 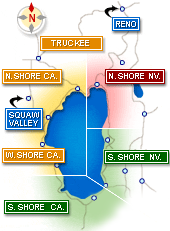 Check here if you are looking for a Lake Tahoe golf course close to all of the most popular Tahoe travel destinations. Lake Tahoe is one of the coolest places to golf because no matter where you go you get beautiful scenery. Whether it's soaring pine trees or sparkling lake waters, you are sure to have something to look at while your buddy searches through the bushes for his long lost golf ball. 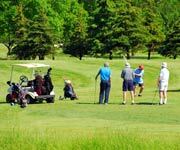 Resort at Squaw Creek Golf Course: For a challenging course that will take you through both mountain and meadow terrain there is none better than the Squaw Creek Golf Course. This course is a Par 71 doozy with 6,931 yards and 18 holes of exciting challenges, beautiful views and a very classy atmosphere. Bring the whole family but leave your lakeside denim shorts at home! The Resort at Squaw Creek is an argyle-only type golf course. 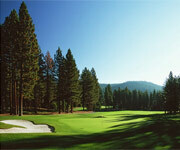 Tahoe Donner Resort: This golf course is a departure from Squaw Creek with a great rustic vibe and affordable prices. An emblem of golf courses in the high sierras, Tahoe Donner Resort is a great place to truly enjoy natural Lake Tahoe beauty without breaking the bank. Make sure you grab a bite at the Tahoe Donner Lodge to stave the hunger you work up on the links! Edgewood Tahoe Golf Course is the only place in Tahoe where you can hit the links with a stunning view of the lake! Whether you're a beginning golfer or just a veteran looking for a short round on the links, executive courses are great! Executive courses in Lake Tahoe are half the length of a regular 18-hole course and are therefore perfect for new golfers ready to learn the ropes, or old golfers looking for a shorter golfing experience. Lake Tahoe executive courses are unique because of the gorgeous mountain and lake scenery that surrounds each one. More often than not the scenery becomes the challenge. 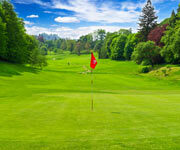 Tahoe Paradise Golf Course: Known for its great affordable prices, Tahoe Paradise Golf Course truly is a paradise! Not only do the rates start out great for such a fun and challenging executive course, but you can also save money by opting to walk the course instead of riding it. And since it's shorter than a regular championship course, walking is totally feasible. Feather River Golf Course: With 2,822 yards of golfing greens and a location tucked away in Blairsden, north of Reno, Feather River 9 hole executive course is a great place to hit the links and enjoy the great outdoors. They have special discounts for seniors and students, and offer the choice of either a power cart or a hand car to make your golfing experience the best it can be. The golf course designed by Robert Muir Graves has everything you'd expect from a top-notch Tahoe golf resort. Welcome to Lake Tahoe's Best guide to golf courses and golfing in the Sierra! Here you will find information on green fees, total yards, pars, ratings, slope, course descriptions, rentals, lessons and more. Seasons vary from Tahoe golf course to course with some courses that get mild winters are open year round. In Lake Tahoe, you could actually be skiing and golfing in the same day during certain times of the year! To help you with your Lake Tahoe golf vacation planning, each Lake Tahoe golf course description will include their most important information. 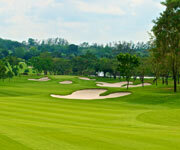 They say, at 6,000 feet of elevation, the golf ball travels 25 yards farther on a drive!! Perfect conditions for that golf shot you'll remember for a lifetime. General guide is to hit one club less when you're at Tahoe golf courses than you would at sea level. Play Golf Where It's Beautiful. Northstar California Golf Course Features the Earliest Twilight Hours & Best Overall Experience! 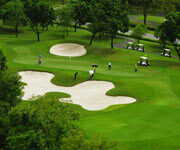 Learn to Golf Like a Pro at Old Greenwood Golf Course! 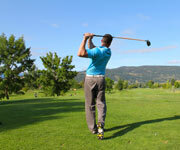 Need accommodations near golf courses in Lake Tahoe? North and South Lake Tahoe have Lake Tahoe golf packages and lodging accommodations for everyone with hundreds of hotels, motels, full service luxury resorts, casinos, inns, cabins and vacation rentals along with incredible restaurants for your after golf pleasure! Each year in July, the Annual American Century Championship Celebrity Golf Tournament is held at the Edgewood Tahoe Golf Course in South Lake Tahoe. Including a purse of roughly $600,000 or more, and lots of network television exposure, it's always lots of fun for players (including professional athletes and entertainers) and spectators. Below we list a number of golf courses in Lake Tahoe located around the basin and a few more in Carson City, Minden/Gardnerville and Reno-Sparks. Enjoy your round of golf in Lake Tahoe!